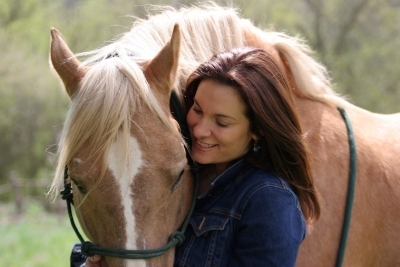 Neda DeMayo, president and founder of Return to Freedom, has worked for over twenty years on wild horse and burro issues with a focus on solutions, and is a recognized authority on wild horse behavior. DeMayo, works nationally to elevate the status of America’s wild horse and burros through advocacy, education, media, programs and events. With a vision to create a sanctuary model to explore minimally invasive wild horse management that could be viable on the range, she founded Return to Freedom in 1997. Neda speaks nationally at press conferences, educational venues, rotary clubs, public and private venues. She has held a government contract to remove horses on horseback to sanctuary so they would not be dispersed or slaughtered, has been a hired consultant for a feasibility study for a large preserve in the state of New Mexico. In 2004, after a trek into some of Nevada’s public land Herd Management Areas (HMAs), DeMayo founded the American Wild Horse Preservation Campaign to protect the free-ranging lifestyle of America’s wild horses on the range for generations to come as part of our national heritage. DeMayo recruited attorney Virginie Parant to help her create a coalition of a diverse range of public interest groups, animal welfare and environmental organizations to share a unified voice and coalition to support America’s wild horses and burros on federal and state lands. The AWHPC was conceived not as a new group nor a fundraising entity, but as a united platform to engage a firm grassroots base. Prior to devoting her life to wild horse and burro preservation, DeMayo was successful both in the Holistic Healing arts and later in fashion and costume for theatre, film and print. Her clients included A-list actors and working with publicity teams developing actors from unknown or character actor to lead. 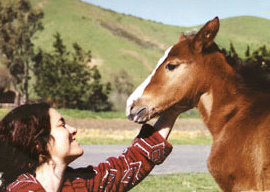 In 1998, DeMayo began developing Return to Freedom’s American Wild Horse Sanctuary on a 300-acre ranch located in the rolling, coastal hills of Lompoc, California. With the help of family, friends, volunteers, she was able to launch a model for minimally intrusive wild horse management, and ecotourism to build a small support base. After a few years, Return to Freedom was able to hire some staff and with limited funding, maintain a high standard of equine care and ranch management. The facility, once run down and used for chicken breeding and cattle, has been transformed into a humble but enchanting sanctuary and educational center hosting over 1000 guests annually and reaching tens of thousands of people a year through advocacy, programs and events. Today, RTF provides care and refuge in 4 locations, for over 500 wild horses and 44 burros that have been captured and removed from state or federal lands. RTF has pioneered minimally-intrusive, natural management of wild horses utilizing Native PZP fertility control, a method that has allowed the sanctuary to maintain horses in their natural social bands. Neda is currently focused on strengthening Return to Freedom’s educational programs on and off the range, and establishing a self sustaining Wild Horse and Burro Wilderness Preserve with the support of the RTF Board of Directors and friend and actor Robert Redford. So many people ask me what first made me get involved with wild horses and start Return to Freedom. Then I get a lot of the same questions so I thought I’d write this letter! I like to tell people that a six year old created RTF! One of my earliest memories of wild horses was watching them being chased and captured on television. Whether it was a movie or the news I cannot recall, but I will never forget the anguish I felt as a 5 year old child standing by helplessly as these beautiful horses were traumatically chased and captured. I cannot remember when I was not in love with horses, it was the first word I spoke according to my mother (Stella DeMayo). I began riding lessons when I was four years old, and in the years that followed I “lived on the back of a horse.” Living in Connecticut surrounded by miles of trails, I rode my horses whenever there was daylight and sometimes by moonlight. I competed in hunter-jumpers, competitive trail and eventing. I attended a prep school for 2 years then transferred to a new alternative school focused on humanities and the arts. I studied mixed media and video, and joined the Connecticut puppet guild performing at the Connecticut Shakespeare Festival. I graduated mainly due to my writing portfolio. After graduation I immediately left the east coast and travelled across the United States to California having amazing adventures along the way! When I reached California in 1979, I studied mask performance and pantomime with Leonard Pitt in Berkeley. A classmate and I performed street theatre, and gave mask making workshops in Berkeley and Project Artaud. I visited a friend in a yoga ashram and decided to study and become a holistic practitioner. I became certified in a variety of natural healing modalities including Irridology (with Bernard Jensen), Polarity Therapy (with Alan Seigle) and Alchemical De-hypnotherapy (with David Quigley). My pursuits in the theatre, healing arts and meditation led me to travel extensively, experiencing different cultures around the world. I returned to California and missing the creative arts I pursued fashion design. I later moved to Los Angeles to join my sister and friends in their theatrical endeavors. Holding the vision of one day creating a sanctuary for hooved mammals (specifically wild horses and burros), I spent 6-7 years as a costume designer and fashion stylist mainly in Hollywood. I worked with international art directors, magazines, photographers, designers and A-list celebrities. Throughout the years I still rode other people’s horses but two serious automobile accidents in 1994 changed everything and I realized that I needed to get clear about what I really wanted to do with my life. You just don’t know how long it’s going to last so I asked myself what would I do if money was no option…and then I did not make a move until I really ‘saw” it…and I have never looked back. In the mid 1990′s the Associated Press was doing a widespread expose on the adoption, abuse and slaughter of wild horses. Like many other Americans, I was exhilarated to discover that there were still wild horses surviving in remote areas, but I was outraged that they were being destroyed. I researched other sanctuaries and the politics affecting wild horses. I also visited other wild horse sanctuaries and a vision became clearer, and my conviction stronger: the general public and government agencies need to align with nature’s priorities. With a deep commitment to preserving what is left of our open spaces, natural resources and wildlife, Return to Freedom Wild Horse Sanctuary was born. In the 1990s, I studied with various natural horsemen, all wonderful communicators in their own right. Because of our common passion for wild horses, I developed a strong friendship with horse trainer Carolyn Resnick. I spent two years learning Carolyn’s liberty training methods. Based on the leadership dynamics within a balanced herd, Carolyn’s methods were the most congruent to how I saw horses interacting with each other. Spending 2 years with Carolyn I developed my Arabian mare Tajradda, purely at liberty, no ropes. I had always dreamed of learning haute école and going to the Spanish Riding school, with Carolyn I went from moving with my horse at liberty to starting her bridleless, to a safe trail horse and liberty exhibition horse. It was a dream. In looking back it all makes sense–the natural healing modalities, collaboration with artists, publicists and media. My intention is that my time on earth will inspire love, reverence and joy for the planet and all the enchanting creatures that live here. I also hope that parents will nourish the dreams of their children–a six year old created Return to Freedom! The dream of harmony and balance between humans and the environment lives in all of us. For some, it is forgotten or misled. Return To Freedom’s American Wild Horse Sanctuary is an environment where, through direct communion with the natural world, children and adults alike can recognize nature as our home and not something that needs to be conquered. That is my dream.